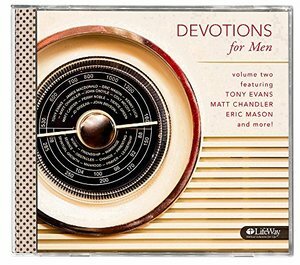 Devotions for Men Audio CD Volume 2 is a second collection of highlights from selected LifeWay Bible studies for men, featuring best-selling authors. It’s ideal for use when you don’t have enough time for concentrated reading or in-depth Bible study. Listen while you commute, exercise, or complete the honey-do list, or whenever you need a little extra wisdom and encouragement for the challenges you face as a man. The 12 segments each average 10 minutes in length.Authors and subjects include: 1. Eric Mason from Manhood Restored―Jesus, the Ultimate Man 2. Tony Evans from Kingdom Man―Aligning Your Life with Christ 3. James MacDonald from Authentic―Authentic Prayer 4. Colt McCoy and Matt Carter from The Real Win―Be a Man Who Leads 5. Tierce Green from 33 The Series: A Man and His Work―A Man’s Workplace Traps 6. Kenny Luck from Family―Serving Your Wife 7. Matt Chandler from Recovering Redemption―The Heart of the Problem Is the Problem of the Heart 8. Perry Noble from Overwhelmed―From Overwhelmed to Overcomer 9. J.D. Greear from Gospel Revolution―How the Gospel Changes Your Life 10. Kenny Luck from Friendship―Getting Real with Other Men 11. John Bryson from 33 The Series: A Man and His Marriage―Pursuing a Great Marriage Friendship 12. John Croyle from The Two-Minute Drill to Parenting―Know Your Purpose as a ParentFeatures: Best-selling authors and leaders in men’s ministry12 inspiring devotions on topics of interest to men, averaging 10 minutes in lengthAlso sold as a bundle by downloading from lifeway.com/devotionsformen Benefits:Get reliable biblical truth from trusted men’s teachers daily.Grow spiritually by focusing your heart and mind on God’s will and purposes.Obtain biblical wisdom and practical tools for tackling the unique challenges you face each day as a man.Learn ways to be a better husband and father.